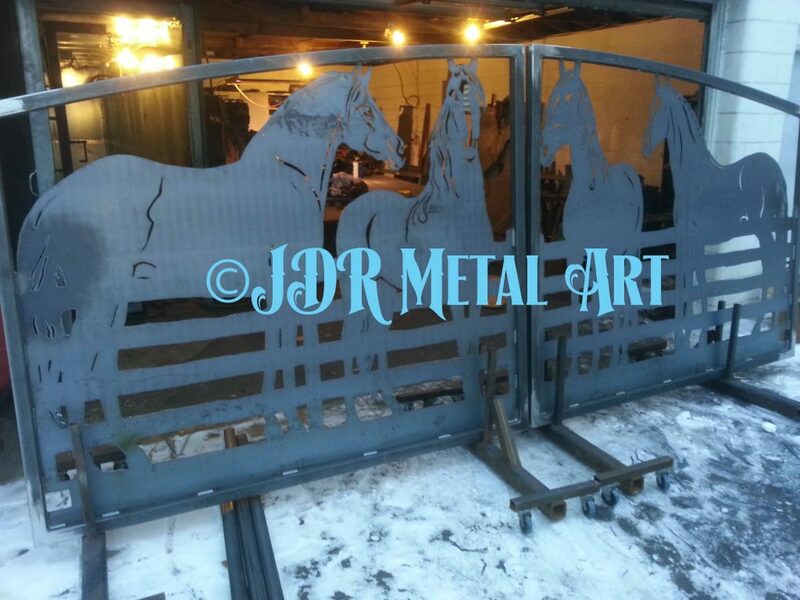 custom gate projects Archives - Custom Driveway Gates - Iron Steel & Aluminum - JDR Metal Art - FREE Standard Shipping! 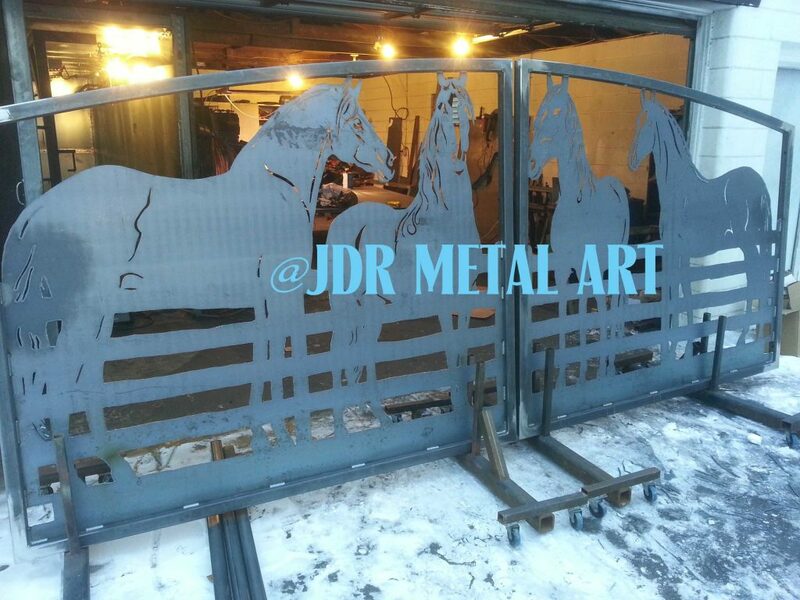 Here we have a set of horse themed Kansas City driveway gates which was designed for a 14′ entrance and custom built by JDR Metal Art. This project was turned around in about 2 weeks from the time of deposit until we shipped it from our Columbus, Ohio facility. We used all US made steel for the frame and silhouettes with 1/8″ thick steel sheet for the horse and fence silhouettes. The gate frames are mixture of square tubing in 1/8″-1/4″ wall thickness (the thicker tubing being for the hinge side of the gate frames). The entry gate posts are 4″ square tubing steel with 1/4″ wall thickness and the hinge sockets are welded to them and include grease fittings and stainless steel ball bearings for a super-smooth swing.The arches were bent with a hand roller and the gate silhouettes were cut by hand with a plasma cutter. The gates and posts were pretreated with an eco-friendly rust preventive and bonding promoter (Picklex) and then electrostatically coated with two passes of 60% gloss black super durable grade powder coat baked to a finish at 400 degrees in our in-house powder coat oven. Then we packed them up on a crate with plenty of foam and cardboard to protect the beautiful powder coat finish during transit to their final destination at a Kansas City residence. We can design a new gate for your driveway entrance. Our gate design process is very reasonably priced. 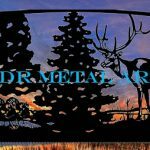 Let us know when you’re ready to get started on your new driveway gate with a theme designed especially for you by JDR Metal Art! Here at JDR Metal Art we built these custom automatic driveway gates for a beautiful residence in north central Ohio in the spring of 2012. It is made from steel material and plasma cut by hand with a Hypertherm plasma cutter. The overall width is 20′ and the top of the gate towers approximately 7′ above grade. It is solar powered by Liftmaster dual swing gate openers, It can be activated by remote controls, a keypad, and an automatic exit sensor. 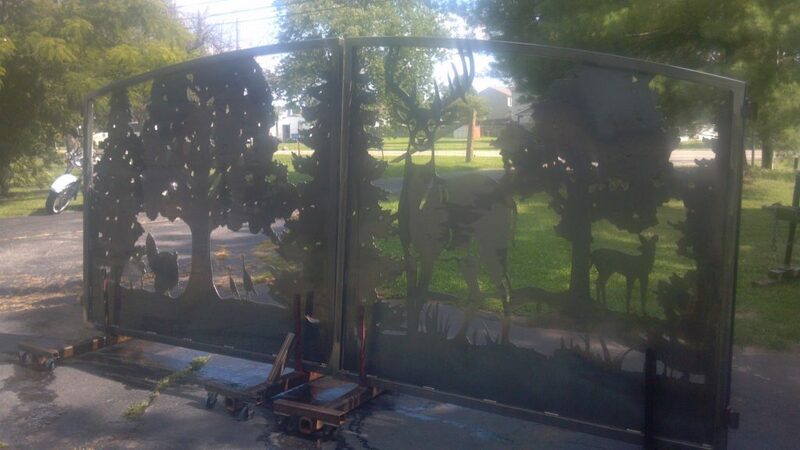 We can custom design any gate themes you may have in mind, including but not limited to wildlife gates, equine gates, and tree gates. We are able to alter almost all of our existing designs to suit the size needs of your driveway entrance. 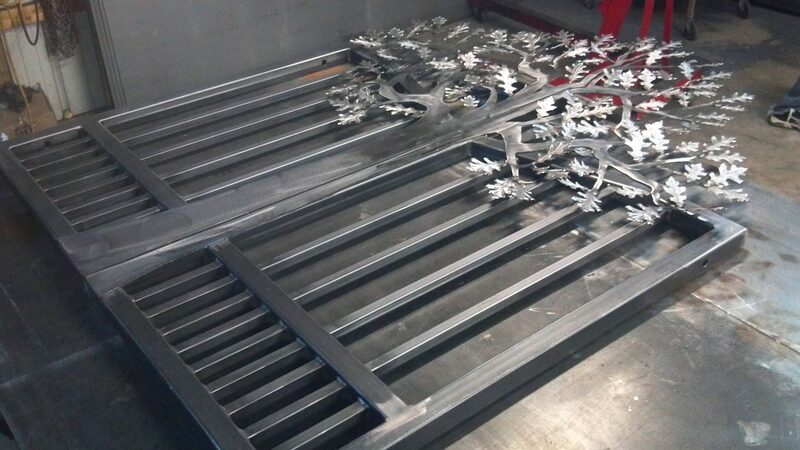 We also make custom wrought iron gate designs from scratch if you are interested. All of our automatic driveway gates are pretreated, primed and powder coated for long lasting beauty and durability. They are ready to have openers mounted to them and power supplied for hands-free entry and exit with the proper automation equipment. A keypad and automated exit sensor are highly recommended for visitors. Handheld transmitters can be supplied to allow operation from the comfort of a vehicle. Walkway Gates – Oak Tree Design. Garden Gate By JDR Metal Art. This oak tree themed walkway gate was custom designed and built by JDR Metal Art in Columbus, Ohio and then shipped to Maryland where it will be spending many years being a gate in a backyard garden. It is a miniaturized version of our oak tree themed driveway gates. It measures 5′ wide overall; the height is 4′ tall on the ends rising to 6’8″ tall in the center. The oak tree leaves are 16 ga. stamped steel while the trunk and branches are made from 3/16″ sheet metal that is welded to a 2″ square tubing frame featuring smaller 1″ pickets. We offer custom entry gate designs for everything ranging from garden gates to gates for walkways and driveways. All we need is a basic design theme to start with and we will provide you with an awesome design and gate and experience that you could not be happier with. Our design themes options are truly just about unlimited but include equine silhouette entry gates and wildlife silhouette entry gates. 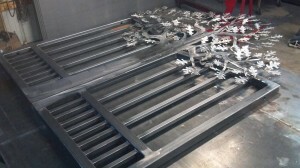 All JDR Metal Art entry gates are handcrafted from American made materials in our Columbus, Ohio fabrication facility. 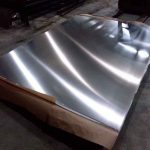 We also do our own powder coating in-house be sure that not a single spot or procedure is missed when preparing the metal to receive a long-lasting beautiful finish. We apply a conversion coating pretreatment to each gate, followed by a coat of zinc rich primer and then a top coat of “Super durable” exterior grade powder coat. Our standard color is a medium gloss black but over 6,500 other colors are available upon request. We can ship nearly anywhere in the world using a network of freight brokers to ensure we are getting the best rates for our clients. Each gate and its corresponding posts and hinges are carefully wrapped in multiple layers of shipping foam with double-walled corrugated sheeting protecting them. We then strap them down to shipping pallets. Feel free to contact us using the form below. Let us know the size of gate you are looking for, the basic design theme, and your zip code so we can provide you with a custom walkway gate quote.